A favorite fantasy game for engineers is to imagine how they might re-invent essential technology from scratch. If you were stranded on an island, or left behind after Armageddon, and you needed to make your own blade, say, or a book, maybe a pair of working radios, what would it take to forge iron, make paper, or create electricity? Occasionally tinkerers get to engage their fantasy. In February 1942, R. Bradley, a British Officer in the Royal artillery in World War II was captured and then held prisoner by Japanese in Singapore. Their camp was remote, supplies were almost non-existent, and they were treated roughly as POWs; when they rebelled they were locked in a confinement shed without food. But they were tinkerers, too. Together with some other POWs in his camp, Bradley stole hand tools from the Japanese soldiers and from these bits and pieces he transformed scrap metal into a miniature lathe. The small lathe was ingenious. It was tiny enough to be kept a secret, big enough to be useful. It could be disassembled into pieces that could be tucked in a backpack and moved in the camp’s many relocations. 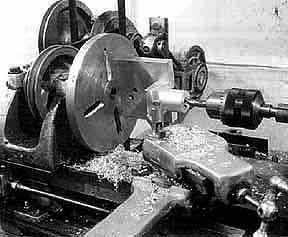 Since large pieces of metal were hard to acquire without notice, the tailstock of the lathe was two steel pieces dovetailed together. The original bed plate was cut with a cold chisel. The lathe was a tool-making egg; it was used to manufacture more sophisticated items. With it the prisoners machined a duplicate key for the solitary confinement shed (! ), and manufactured a hidden battery source for a secret radio. During the two years of their interment the lathe remade the tools — like taps and dies — which were first used to create it. A lather has those self-reproductive qualities. Recently a guy re-invented the fabric of industrial society in his garage. The late Dave Gingery was a midnight machinist in Springfield, Missouri who enjoyed the challenge of making something from nothing, or perhaps it is more accurate to say, making very much by leveraging the power of very little. Over years of tinkering, Gingery was able to bootstrap a full-bore machine shop from alley scraps. He made rough tools that made better tools, which then made tools good enough to make real stuff. 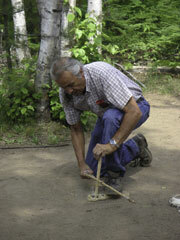 Gingery began with a simple backyard foundry. This was a small 5-gallon bucket packed with sand. In its center was a coffee can of smoldering BBQ charcoal. 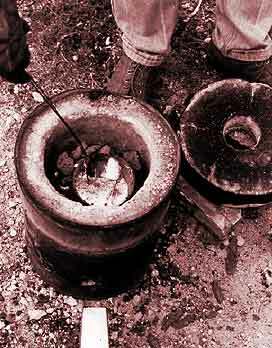 Inside the can of charcoal was a small ceramic crucible into which he threw scrap aluminum – cans, etc. Gingery forced air into this crude furnace via a fan, burning the charcoal with enough heat to melt the aluminum. He poured the molten metal into a mold of wet sand carved out in the shape he wanted. When the cast was cool he had a workable metal holding plate, which became the heart of a homemade lathe. Other lathe parts were cast. He finished these rough parts with hand tools. His one “cheat” was adding a used electric motor – although it is not impossible to imagine a wind or water powered version. When the rough lathe was up and running he used it to turn out the parts for a drill press. With the drill press and lathe operating he constantly reworked pieces of the lathe itself, replacing parts with improved versions. In this way, his tiny machine shop was an upcreation device, capable of generating higher a machine of precision than itself. He used this upcreation tool to manufacture the pieces needed for a fully functioning milling machine. When the milling machine was completed he could make almost anything. Gingery recapitulated the evolution of technology, the great pattern by which simple tools create more complex tools and so on infinitum. This expansion of upcreation power is the means by which an entire culture lifts itself out of mud by pulling up on its bootstraps. 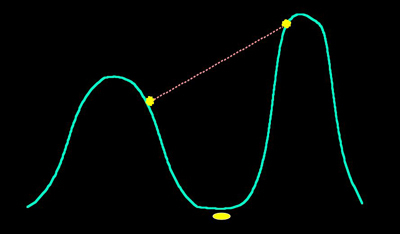 Yet is it obvious this little demonstration is not pure. As a way to make your own machine tools, Gingerys’ plans are fine and dandy. He uses cast off washing machine motors and other junkyard scrap parts to grow a fairly robust machine shop. But as an example of relaunching a technological society in a kind of Robinson Crusoe maneuver – landing somewhere and starting civilization up — it’s a cheat because in this latter game you don’t get to start with discarded aluminum cans, scavenged nuts and bolts, old electric motors and waste sheet metal. To really navigate the minimum bootstrap path through the industrial web, you’d have to start with finding your own ore, mining and refining it with primitive tools, firing up bricks, rolling out sheet metal, developing screws and bolts by hand – all just to get you to the point where you’d have enough tools and materials to make the simple 5-gallon bucket foundry that Dave Gingery started with. About two dozen survival schools in the US will host, on any given weekend, a class on how to make your own clothes from hides, chip a knife from stone or bone, cut and assemble a shelter from trees, and generally live off the land with self-made tools. They start where Gingery does not – with the elements as we find them in nature. It’s a lot of work. Starting a fire without matches is possible, but only after about as much practice as it takes to become an expert at a video game. Even with all the tools the world’s best expert can make from scratch this way (about 100 in total), it’s a hard life that appeals to few. Beyond these primeval tools, the interdependency of created objects is astounding. Select at random any one of the many thousands items within the reach of where you now sit. None of them could exist without many of the others around it. No technology is an island. Let’s take a very sophisticated item: one web page. A web page relies on perhaps a hundred thousand other inventions, all needed for its birth and continued existence. There is no web page anywhere without the inventions of HTML code, without computer programming, without LEDs or cathode ray tubes, without solid state computer chips, without telephone lines, without long-distance signal repeaters, without electrical generators, without high-speed turbines, without stainless steel, iron smelters, and control of fire. None of these concrete inventions would exist without the elemental inventions of writing, of an alphabet, of hypertext links, of indexes, catalogs, archives, libraries and the scientific method itself. To recapitulate a web page you have to re-create all these other functions. You might as well remake modern society. This is why restarting a sophisticated society after a devastating setback is so hard. Without all the adjacent items in a given ecological bundle, a single technology can have no effect; therefore you need them all working to get one working; therefore you have to repair them all at once. When war, earthquake, tsunami, flood or fire destroys a society’s infrastructure indiscriminately, the job of restarting/rediscovering them all at once is impossible. The conundrum of disaster relief is a testimony to this deep interdependency: one needs roads to bring petrol but petrol to clear roads, medicines to heal people, but healthy people to dispense medicines, communications to enable organization but organization to restore communications. We see the interdependent platform of technology primarily when it breaks down. This is also the explanation of why we should not confuse a good clear view of the future with a short distance. We can see the perfect outlines of where technology is going, but we tend to overestimate how soon it will come. Usually the delay (in our eager eyes) is due to the invisible ecology of other needed technologies that aren’t ready yet. The invention will hang suspended in the future for many years, not coming any closer the now. Then when the ignored co-technologies are in place it will appear in our lives in a sudden, with much surprise and applause for its unexpected appearance. A lovely read. Its nice to stop occasionally to take stock of what we have, and what we have achieved. Makes people stop smell the roses and cherish what we have. Thanks. How soon do you expect the waste dumps that contain those things to go away? The lesson I draw is that if civilization were to break down, it wouldn’t be as broken as we think. Aluminum is hard to get from the ground but easy to melt from cans, and easier to cast than iron or copper. All of a sudden the trash that annoyingly refuses to go away, has civilization- rebooting possibilities. The hard thing would be giving some devoted tinkerers the free time they would need to concretize their knowledge before dying. The sad truth of the matter is that folk with these skills are dieing off & kids these days are more interested in video games. Folk with real skills are seen as tinkerers yet footballers earn a polltuce for kicking a ball around! Although equally, many people are sharing their knowledge via online tutorials/youtube etc giving others (kids included) the opportunity to learn these skills who may not have been born into a family who knew someone in a given trade to teach them. One thing to say in defense of those guys kicking a ball around. well, 2. 1. They get paid fairly little in general for what wear and tear they put on their bodies. 2. Sports innovation has driven the medical field, and much like the space program of NASA, that tech trickles down. And if you read the paragraph, the sand holds charcoal and a ceramic crucible, and the ceramic is what holds molten metal. Gingerly covers all that stuff. And if you continue to read, he’s talking about the sand mold that the molten metal is poured into from the crucible. Greensand, as used by Dave Gingery in his books, is not “dried very, very thoroughly” before a pour, nor is it formed with “wet” sand. The moisture content is just high enough to allow the sand to hold its shape for molding, without excess moisture. The metal can be poured as soon as the mold is finished. As long as the sand isn’t too wet, steam does not form in large enough quantities to cause bubbling, as it can dissipate through the vents and the permeable sand surrounding the mold cavity.